Jon Christensen is an adjunct assistant professo in the Institute of the Environment and Sustainability, the Department of History, and the Center for Digital Humanities at the University of California, Los Angeles. He is an environmental historian, journalist-in-residence, and a founder of the Laboratory for Environmental Narrative Strategies at the Institute of the Environment and Sustainability, a senior fellow in UCLA’s cityLAB. 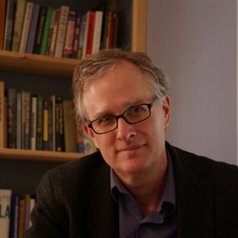 He is a regular columnist at LA Observed and editor of Boom: A Journal of California, a quarterly magazine published by the University of California Press that brings scholars, researchers, journalists, writers, artists, photographers, policymakers, advocates, and the public into common conversations about California in the world. And he is a partner and strategic adviser at Stamen Design, an interactive design studio specializing in mapping, data visualization, and strategic communications. Jon was executive director of the Bill Lane Center for the American West, an interdisciplinary center for research, teaching, new media, and journalism at Stanford University before coming to UCLA. He has been an environmental journalist and science writer for more than 30 years. His work has appeared in The New York Times, Nature, High Country News, and many other newspapers, magazines, journals, and radio and television shows. He was a Knight Journalism Fellow at Stanford in 2002-2003 and a Steinbeck Fellow at San Jose State University in 2003-2004, before returning to Stanford to work on a Ph.D. in History. He is currently finishing a book entitled “Critical Habitat: A History of Thinking with Things in Nature."